Step back in time at the Capt. Morse House in Historic Downtown St Marys. 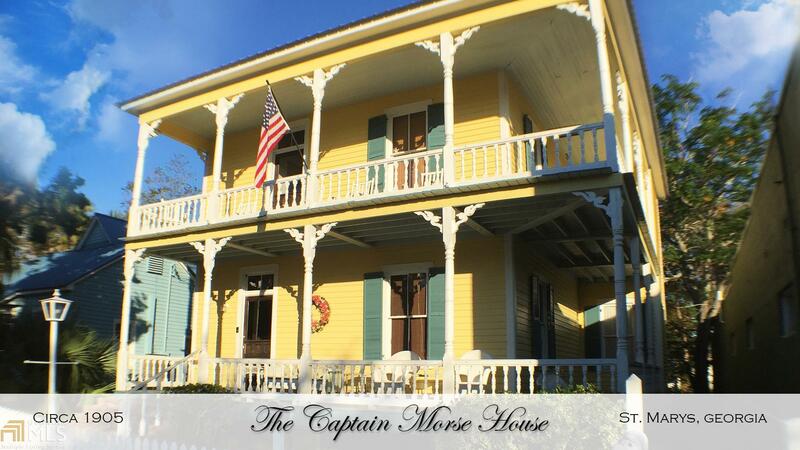 Sit on the double porches overlooking the main street, the waterfront & all festivities. This charming 4 bedroom, 3 bath is located in the heart of the historic district & within walking distance of the waterfront park, restaurants, shops, galleries & museums. Ferry dock to Cumberland Island just a short walk away. This home has recent refinishing/reparation to the heart pine floors, electric updated & several other updates. Home is currently on VRBO with a 5-star reviews & Premier Partner status, Airbnb, Georgia Rent by Owner & Houfy. Home is being sold completely furnished! Zoned Res/Comm. Seller is offering a Resort Vacation Certificate to be given within 30 days of closing!